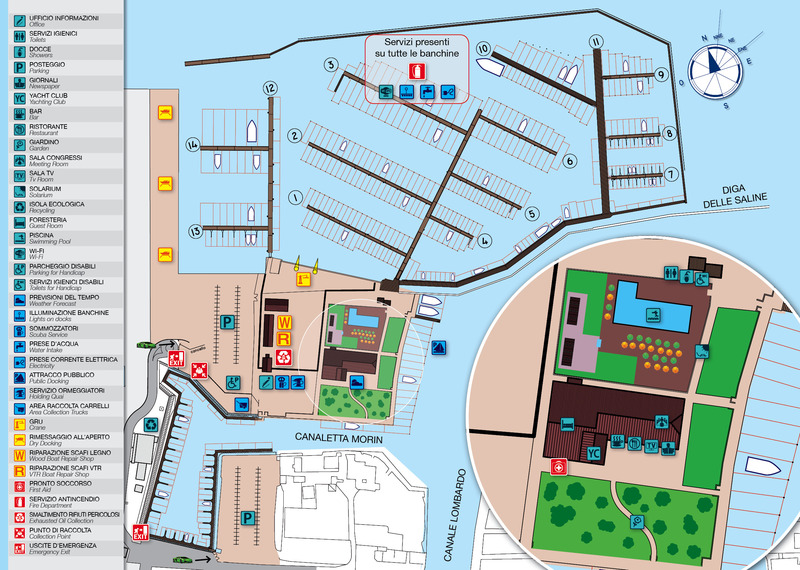 Darsena Le Saline is the ideal berth for every boat owner! Sport fishing, sailing, lagoon tourism, cruises to Croatia, daily sea trips, sightseeing and gastronomic tours in Chioggia. The safe, deep-water harbour is ideal for all types of sailing and/or motor boat and, thanks to its exceptional position, ensure maximum incoming and outing safety whatever the weather. The harbour develops around quays, fixed and floating jetties south and north of Isola Morin, protected against waves and all winds. More then 450 mooring places for sailing and /or motor boats up to 24 meters in length with draughts up to 5 meters are equipped with mooring poles or fingers with water and electricity suplpies, made avaliable using an electronic key. The harbour also boats a large, dry depot for boats, pleasure craft and rubber dinghies. Large bathrooms and hot shower are always avaliable for guests. Sailors boasting a decade of experience in nautical work are avaliable 247 h/day, 365 days/year for every type of assistance.